found a beautiful hutch on craigslist. It was just the right size for my studio space. It was solid cherry, a lovely Temple-Stuart 50's piece. The cabinet knobs and pulls are being replaced, I found these small matte black, clay knobs at Hobby Lobby for half price. The drawers will have matte black, bin pulls that I ordered online. They are cast iron and have a raised design of rose and thistle, love them. 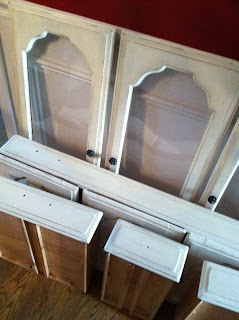 Painting the hutch with Annie Sloan, old white, has been easy and the results are just what I was hoping for. Two coats, straight on, clear wax, distress edges, dark wax, buff to a gorgeous sheen. This is my second project using this paint and the blog land hype is well deserved. Next up is the cabinet and hutch top. I will water down the paint slightly and roll it on with a foam roller. The surface area is large and the results will be smoother than painting with a brush. Hopefully, soon I will have the finished furniture to show you. 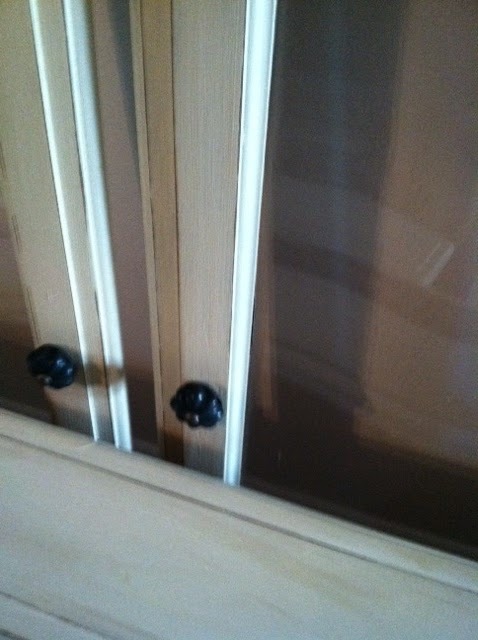 Do you think I should paint the back of the hutch another color or wallpaper it? Thanks Karen...I think paint also. I am leaving a comment and hoping it is fixed. It looks like it's going to be beautiful! Don't feel guilty about painting the wood~it'll still be there under the paint. :) That's what I tell my husband when he says things like "You can't paint walnut!" I think either paint or wallpaper would be pretty. You could stencil the back, too, if you were so inclined. It's going to be gorgeous. I wouldn't feel guilty about painting it though. Love the comment from Suzanne...the wood is still under the paint. I'd probably paint the inside a contrasting color. Such a great project.